This movie wasn't released. It was BEACHED. The really need to make a provision for 0 stars. That way people can accurately rate a movie this bad...so subtract 1 star from my rating and that is the true rating for this terrible film. Stay home. Not worth the effort or the money! Been wanting to watch this for a while, finally made time for it. Wow what a disappointment. I dragged my boyfriend to see this bomb. About 40 minutes in I asked if he minded if we walked out before the end. Yeah it was that bad...no actually worse. It did make me skip dessert and go early to the gym though. 4 of us did a girls night out and decided to take a chance that the 5 star reviews were honest....Omg this was terrible, I mean so very bad. It was nothing more than a feel good move for....to say would be inappropriate, but look at Rebbell and fill in the Blank. So bad, that bad doesn't describe it. Save your money for a better movie. Watched this with my daughter, her idea.... She was shocked just how bad this was ZERO Stars is what this truly deserves. I couldn't believe that the new benchmark for a leading lady is now this person.... What message does this send, never ever exercise and eat everything and anything and you will be a movie star. Just watching this dud will raise your cholesterol count significantly. Skip it and go to the gym instead. Wow, this was so bad. Read the 5 star reviews and took a chance. Omg, this is a disgrace. Funny and lovely message!! If you’re under 30 you’ll probably won’t get it or like it. The folks rating movie 3 stars or lower are probably the shallow, superficial young people of today’s society living in the worldly delusion of what their social media feeds them such as on how they should live, look, be like and how “true love” suppose to play out and with whom. You get the point.... lol! Over 30 go watch the movie guys! Absolutely gorgeous Movie with Big Beautiful Women who are worshipped by Male Fitness Buffs Worldwide...going to see it again this weekend for the 3rd time, Rebel , Liam and Priyanka were fantastic. Total Fantasy...a guy who spends 4 hours a day in the gym falls for a girl who has never been to the gym even once. A wonderful, original new movie that is a better way to look at things. Great escape fantasy! Wow, I can't believe this movie was made by a trained film maker. It is like calling Abbott and Costello's who's on first a baseball documentary. Yes I got the humor, no it was not funny. My Girlfriend picked this movie for our date night, she could not stand how bad it was and we walked out about an hour in. Wanted to rate it 0 Stars but forced me to upgrade our rating to 1 star, subtract 1 and you get the true rating. I am also a woman and we both thought Priyanka should have been the romantic lead. Nothing to do with Rebel's girth, she just can't act. Watched this movie last night, didn't find it even remotely romantic, funny or entertaining. Did get the films message, don't go the gym ever, eat every meal at the all you can eat buffet, and you too will be a movie star. Save your money, get the car washed, at least you will have something for your money. If you're under the age of 30, don't bother. This movie has a lot of references to 80s and 90s romantic comedies. If you've seen these movies, you'll love this film. If not, you won't get it. I think this movie went right over a lot of these 1 star rater's heads. Very funny. It's about time someone made fun of romantic comedy. Watched this awful movie, what a waste of money. How is Priyanka not the star, perhaps if they actually wanted the movie to BE Romantic, she would have been...Perhaps if Priyanka gained 100lbs she would have been the star. I thought the movie was pretty funny and had many points where I was actually surprised what happened next. Yes, it’s a really bad movie - bad acting all around, bad script. But all these comments about Rebel’s weight - wow, shocking how unkind people can be. Maybe just stop criticizing people’s appearance - celebrities or not - and try just being decent to other people. Go to Costco and watch them pump gas; much more entertainment for free. This movie message; get fat, eat a lot, be a cute and happy stereotype obese human and the world will love you.These alleged movies are thrown together to make money....nothing else. A feel good movie for the overweight; and I am being kind here. 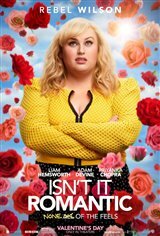 If they called it "Not Romantic at All" it would be a more accurate title. Big disappointment after reading all the 5 star reviews here. They must be paid reviews .